I am the oldest child of six. That, plus my husband’s family, equals many Christmas gifts. This year, we decided to make everything. Homemade gifts tend to be cheaper (though more time consuming), and are often better received than a token impersonal gift. Simple putting time and effort into making a gift automatically makes it more special, at least in my eyes. 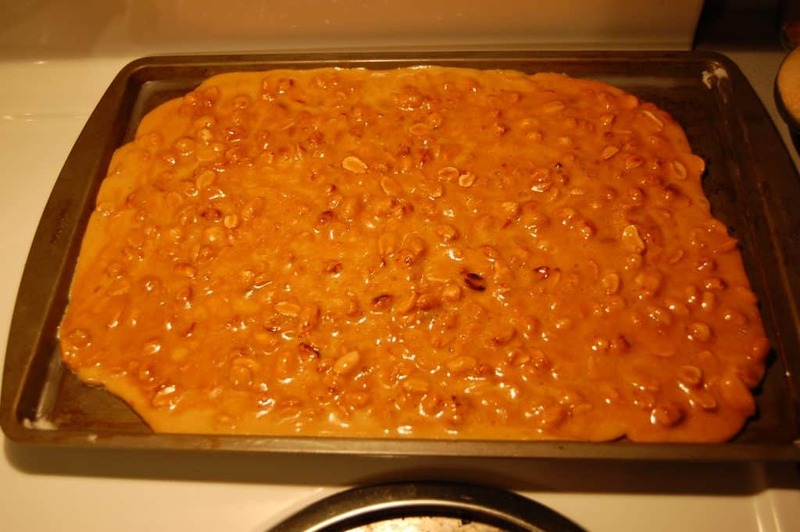 Today’s experiment: Peanut Brittle. You should know by now, if you’ve been reading my articles, that I am not into complicated and laborious recipes. I’ve always thought of making candy as the hardest thing one could possibly do, an unattainable culinary pinnacle in my life. I love to try new recipes, so it was inevitable that candy making would show up on my doorstep one day. This winter, it came, and handed me candies that are neither complicated nor laborious. You’ll need a candy thermometer for this one. Grease two large baking sheets that have a lip. Cook the sugar, corn syrup, and water together in a saucepan over medium high heat until your candy thermometer reads 230 degrees. When it gets there, add your peanuts and stir them around. Let it continue cooking until you get to 301 degrees. Remove the pan from the heat. Add the salt, baking soda, butter, and vanilla. Stir well. 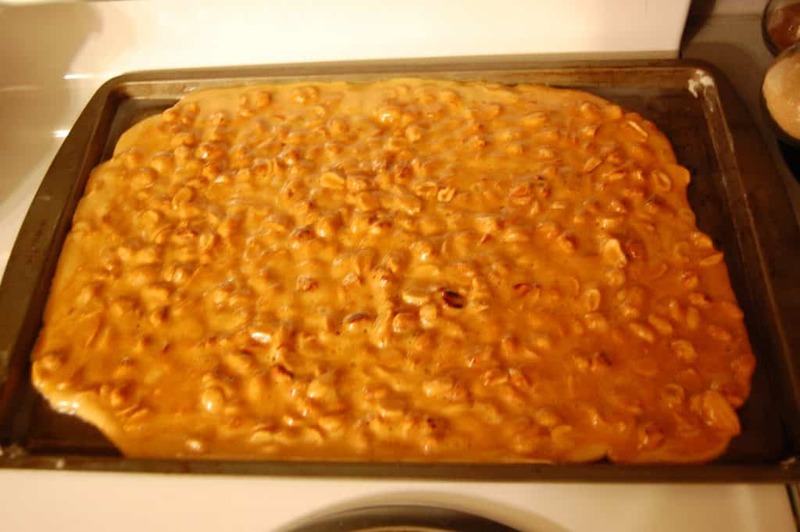 Pour the brittle mixture onto the greased baking sheets. Don’t touch the 301 degree candy thermometer that’s been removed from the pan or you’ll yell and get a blister on your finger, like I did. Use a metal spatula to spread the brittle out as thin as possible. When they are completely cool, break them into pieces. This brittle stays fresh for about a week in a container. We made some that we weren’t giving away for another week, so we stored it in the freezer. That worked just fine. Instead of peanuts, you can throw in any combination that you can think of. We also made brittle with chopped walnuts and a packet of instant coffee. Thanks go to Martha Stewart for that idea. Use any nut or seed that you have on hand and add a bit of any spice you think would go nicely with it. The possibilities are virtually endless. PS Sorry to any relatives who haven’t received their Christmas gift yet and may be reading this!